I really like what you've done with the map. You indicated that you added the attack path from Maryland (Annapolis) to USS4 so that a Northern General could control the Yankee Navy. In order for this to hold true - the North shipyard (New York? or Maryland?) should be able to one way attack all Union ships. And the South shipyard (S. Carolina? or Virginia?) be able to one way attack all Confederate ships. Or maybe the Confederate Navy wasn't as organized? I realize that this could suddenly make those States/Cities much more valuable as they also effectively control each Navy. why does the ocean randomly end? Elijah S, can you PLEASE change the color of the Sherman states? it is really a bad color. I kindof like your idea about the fleet being controlled via 1-way attacks from Maryland... I'll see what I can do. Reverend... the ocean doesn't just end, if you look closer you'll see simulated waves in the black area below. I think this gives it some depth, rather than just a flat 2-dimensional board. Unit... I like the colors and unless this is something that others comment on, it will stay the same. In fact, I DID tone down the blue after one of your earlier pleadings. These is good,now you can try to find real names for ship,instead these i belive not real names. first time I've checked in on this one in a couple of weeks... I assume you're sticking with Davis? Personally I've been against Lincoln to begin with, and now that I've stared at it I think I know why - what stands out about Lincoln isn't his face, but his shirt. His face is almost entirely washed out, especially across the river - as if his face has actually but cut off by the river. It's just kinda weird to me. Anyway, that's nitpicking. This has come along nicely, though i think you could have more fun with your sig! I can see what Rev Kyle was getting at with the ocean "randomly ending" - if the flag extended to the legend it might look cleaner. There are a lot of different backgrounds going on. Forgive me for not reading all of the back posts and ignore this if it's already been discussed, but is the lighter border between W.Virginia and Maryland intentional? Looks like you've got the wrong weight on that stroke. -A Legend Box has been added around "Neutral Territories Earn No Bonus"
-The images of Lincoln and Davis have been turned off. -I think it looks less cluttered like this, especially with the addition of the boxes around the Legend. I'm assuming you were trying to copy what you did on the right legend with the 'Maryland can one-way attack union ships' when you placed the union ship graphic in, but I believe it would look better if you just let the text wrap a bit more and put the union ship on the left like you did for the neutral territories box. Nothing else from me. Everything looks great besides that to my eyes. 1. The thing in legend where it says Maryland can one way attack union ships. Does this mean it can attack all of them or just the Monitor? Can you make it more clear somehow? 2. Swap the names of Dakota Territrory and The Badlands. 3. Move Wisconsin's army circle down slightly so it doesn't touch the words. 4. Move the words Michigan and Indiana to the left slightly so they doesn't toch the border on the right. 5. Remove the fuzzy black area from the bottom of the map. It looks bad with the Essex on top of it. 6. Move the Stonewall's army circle down slightly. 7. Move the Augustana's army circle right so it is under the words instead of the ship. 8. Move the word Tennesse down a very small amount. 9. Move the word Pensylvania up a very small amount. Last edited by spiesr on Wed Oct 31, 2007 3:16 pm, edited 1 time in total. I saw USS Monitor and immediately looked for Merrimack (which is actually the CSS Virginia). Albeit slightly out of it's normal patrol area. Everything else looks great (assuming you follow Coleman's suggestion). Elijah, I'd like to see a large and small version together if they are available, when you have a chance thanks. -The small union ship inside the box stating that Maryland can attack union ships was moved to the left side. -Some army circles and state names were moved slightly. -The Confederate flag was repositioned and levels adjusted a little. I did not change the area at the bottom which simulates waves. It gives the map depth. Some of the army circles for the ships have a kindof pink cast to them. -This will be addressed once I'm sure they're positioned where they will be permanently. Clear from me from here on out. Thanks for the quick response. I pass the ball to Andy and cairnswk for forging this. Do you prefer the board which includes Jefferson Davis or the one without him? A) I like the board WITH the Jefferson Davis graphic. B) I prefer the board WITHOUT the Jefferson Davis graphic. soundout9 wrote: Do you prefer the board which includes Jefferson Davis or the one without him? The poll is pretty much done now... (as soon as the mods turn it off). Also I accidentally deleted the first post instead of the poll initially and have no idea how to reverse it. Hopefully this is recoverable. If not I made an Elijah S post become the new first post so hopefully he can fix it himself. 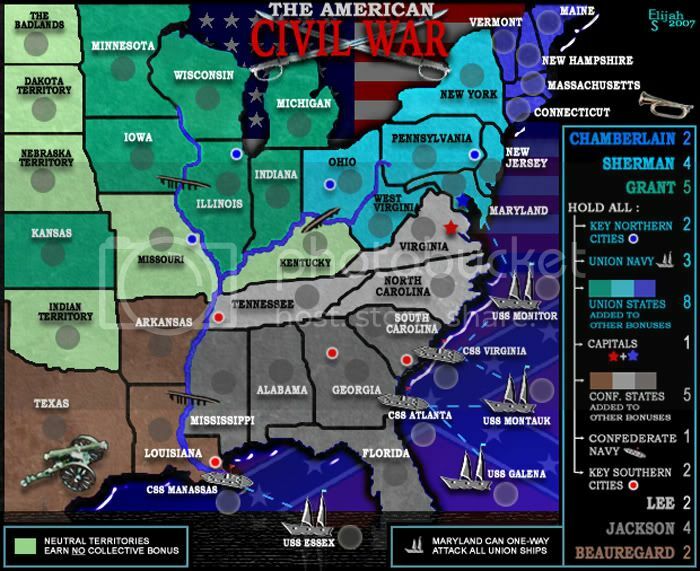 Coleman wrote: Do you prefer the board which includes Jefferson Davis or the one without him? No worries Coleman... It was regarding the poll, which is now kindof a moot point anyway. I love the expanded flag, if you could expand it and florida down to the note about the notes at the bottom I think this map would be perfect. I really love that you're doing a history map that is very accurate. Yes remove the fuzzy thing. It looks bad. You know it would be interesting if you eliminated the attack route between Missip. and Louis. It could create a drawn out situation that could realistically reflect the period, where one player had to circumvent it by attacking through the territories. Chirondom wrote: You know it would be interesting if you eliminated the attack route between Missip. and Louis. It could create a drawn out situation that could realistically reflect the period, where one player had to circumvent it by attacking through the territories. I disagree. I think if that attack route is eliminated, there would be a great disadvantage to whoever is trying to take over the gray areas. The southwestern part would be too easily held. Too late to toss in an idea? Having become a fan of the interesting variants allowed on the maps here, I think it would be interesting to have a one-way north routh through the Shenandoah Valley. Not sure how you would demote it on the map, maybe a route that leads from Virginia to Penn., skipping Maryland? Location: San Diego Ca. U.S.A. The major change here is that the confederate flag has been extended to the bottom of the board. I looked at the suggestions since my last update and don't think that elimintaing an attack between Miss - Louisiana would do anything positive to gameplay. It would force players to take too long a path in order to advance from the east to west or vice - verse. The Shenandoah path is interesting and I'll give that some consideration, but at this point I think the gameplay is pretty much set, except that some bonus amounts may get some review.